Since I started working on the renovation plans of our London home, I’ve always figured out that our kitchen would be white like the rest of our home until I was invited by VIPP last Christmas to participate to a styling blogger competition in their flagship store in Copenhagen and saw their black kitchen designed in-house by Morten Bo Jensen, Head of Design at Vipp. 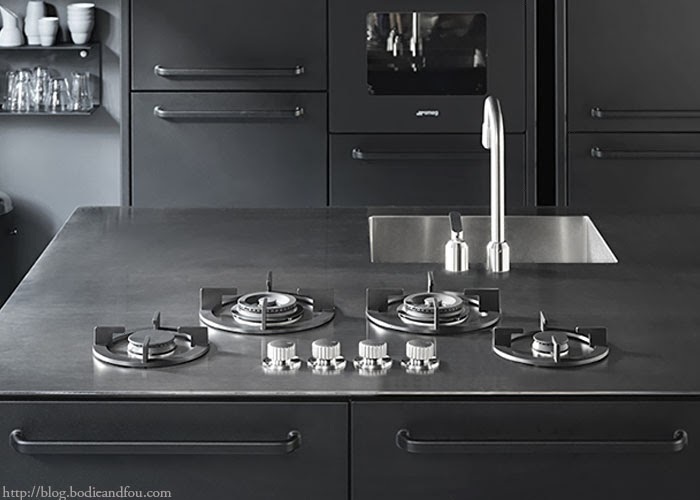 Seeing it on display in their beautiful flagship store (which has polished concrete floors – another thing I would love in our new kitchen), has completely opened up my mind and I see now a black kitchen in our family home is now well within the realms of possibility. Since then, my Kitchen board on Pinterest, has been filling up with gorgeous and inspiring black kitchens. This week, the VIPP kitchen has won the Elle Decoration International Design Award for best kitchen 2014 which is amazing and well-deserved so massive congratulations to the whole team, to this amazing brand which is a family business and to Jette Egelund, for having the drive, vision and passion to pursue what her father had created 75 years ago. Incidentally, as Vipp is celebrating their 75 year anniversary this year, they are on the lookout for some vintage Vipp bins to curate an exhibition. You can recognize the first Vipp bins produced by their wavy and polished chrome lid and a golden logo in cursive letters hand-written by Jette’s father. So if you are lucky enough to own one of these vintage bins, please get in touch with them.